Habit: Perennial herb, from rhizome, 10--120(200+) cm; roots generally red-tipped. Stem: erect, simple or distally branched, glabrous or hairy. Leaf: basal and cauline, alternate; basal petioled, cauline petioled or sessile; blade linear or lanceolate to obovate, entire to 1[2+]-pinnately lobed or toothed, glabrous or sparsely hairy. Inflorescence: heads generally radiate (discoid), 1 or in 2--3s; involucre hemispheric or broader; phyllaries 35--60+ in 3--4+ series, free, +- ovate to oblanceolate, unequal, glabrous or sparsely hairy, margins scarious, colorless to +- brown; receptacle convex, epaleate, glabrous. Ray Flower: generally 13--34+ (0); corolla white, drying +- pink, ray linear to ovate. Disk Flower: 120--200+; corolla yellow, tube +- cylindric, proximally swollen, throat bell-shaped, lobes deltate, resin sacs 0; anther tip triangular-ovate; style tips truncate, papillate. Fruit: +- columnar to obovoid, generally 10-ribbed, glabrous; pappus 0 or fruit wall crown-like at fruit tip. Habit: Plants 10--30(100+) cm. Leaf: basal leaf petiole 10--30(120) mm, blade 12--35(50+) mm, 8--20(30) mm wide, obovate to spoon-shaped, pinnately 3--7+ lobed or irregularly toothed; cauline petioled or sessile, blade 30--80+ mm, 2--15+ mm wide, mid-stem leaves generally irregularly toothed throughout. Inflorescence: involucre 12--20+ cm diam; larger phyllaries 2--3 mm wide. Ray Flower: (0)13--34+; ray 12--20(35+) mm. Fruit: ray fruit 1.5--2.5 mm, tip generally crown-like or with ear-like projections. Chromosomes: 2n=18,36,54,72,90. 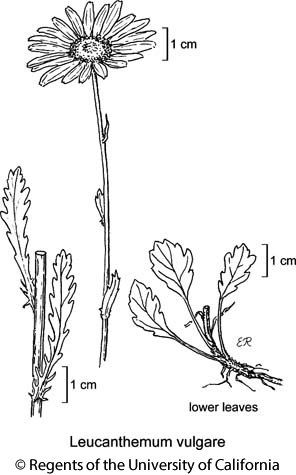 Citation for this treatment: Bruce G. Baldwin, adapted from Strother (2006) 2012, Leucanthemum vulgare, in Jepson Flora Project (eds.) Jepson eFlora, http://ucjeps.berkeley.edu/eflora/eflora_display.php?tid=3801, accessed on April 20, 2019. NCo, KR, NCoRO, CaR, n&c SNH, ScV, CCo, SnFrB, PR, MP; Markers link to CCH specimen records. Yellow markers indicate records that may provide evidence for eFlora range revision or may have georeferencing or identification issues. Purple markers indicate specimens collected from a garden, greenhouse, or other non-wild location.